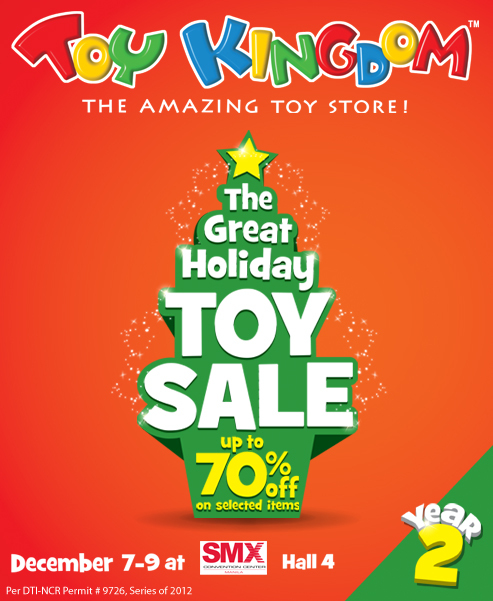 This Yuletide season, find the perfect gift for kids (and kids at heart) at Toy Kingdom Great Holiday Toy Sale! Shop and enjoy up to 70% off on selected toys during this 3-day sale! Save the date: December 7 to 9, 2012 at Hall 4 of SMX Convention Center. Entrance is absolutely free! For more information, like us at www.facebook.com/ToyKingdomPH, follow us on Twitter at www.twitter.com/ToyKingdomPH and call our hotline at 638-TOYK (6388695). See you there!